- D 96089 : "The Vigilante of Pizen Bluff" (Lo$ #6b), from 1996, by Don Rosa. Geronimo, whose real name was Goyathley ("One Who Yawns"), was a medicine man from the Bedonkohe Apache's, who had first joined Mangas Coloradas and then Cochise to fight the Americans. Some 44 years old when Cochise died in 1874, he was held in high esteem as a war leader with strong spiritual powers. His determination to protect his people resulted from the murder of his mother, wife and 3 children by Mexican troops in 1849. When the American government ordered the relocation of the Apache's to the hostile and barren San Carlos reservation in 1877 half the Chiricahua Apache's refused and followed Geronimo and the Nednhi Apache leader Juh into the mountains of North Mexico. By 1886 Geronimo, 17 surviving warriors and their families, were being pursued by 5,000 American troops, thousands of militia, 500 Apache scouts and 3,000 Mexican volunteers. Geronimo finally surrendered on the urging of his followers in September after the Army promised that after a period of time he would be able to return to Arizona. Geronimo and his followers were shipped to St. Augustine, Florida where many died from malaria or tuberculosis. He had a wife, Taz-ayz-Slath, and a child. Scrooge meets "One Who Yawns" in 1890 ("The Vigilante of Pizen Bluff"), when he goes to see his uncle Angus "Pothole" McDuck, who now became an actor and works with Phineas T. Barnum, Buffalo Bill and Annie Oakley in the Wild West show. He meets this Apache Indian and is surprised because he thought that Army had sent them all in a reservation in Florida, but One Who Yawns answers that he went out of the reservations to look for work and that he'd like to be hired in the show because it's well paid and he could show his culture to the Whites. 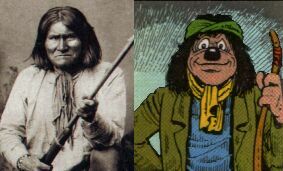 (Don Rosa uses to respect historical facts, but here, he made Geronimo appear while he should be in a reservation. In an article from Komix, he told "The Indian "He who Yawns" was in a settlement in Florida, but he could have very well run away for a few months. Isn't that so? Why the hell should I try respecting authentic historical data in a talking duck story? I don't know... Just because I'm enjoying it, I guess.") Then, Barnum hires him as a guide to chase the Dalton Brothers who have just stolen his money. Then, after hearing his Apache name Goklayeh (another orthograph for Goyathlay), Scrooge understands who he is really, as he was famous. Then, when Scrooge shouts "Geronimoooo" when he attacks the Daltons, Pothole understands that this Indian is the famous Apache Chief.